When looking for favours for my wedding I realised that the natural and organic market is often overlooked. I decided that it would be nice to showcase some "Green" options and support smaller brands. 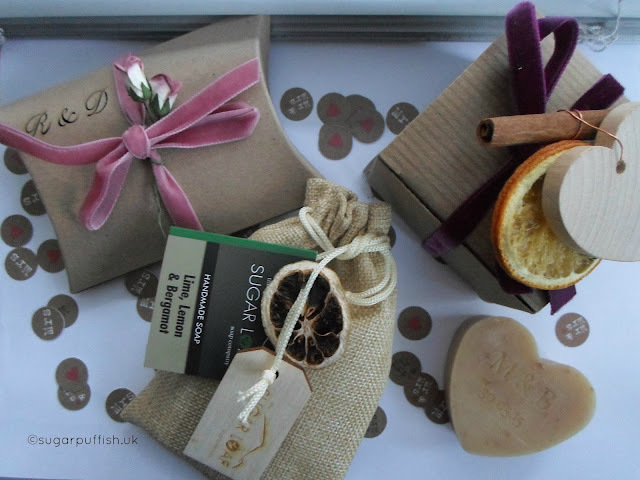 I hope you will agree my selection of favours is the kind guests would love to receive and enjoy using. Sugarloaf Soaps are a Welsh company producing handmade natural soaps. 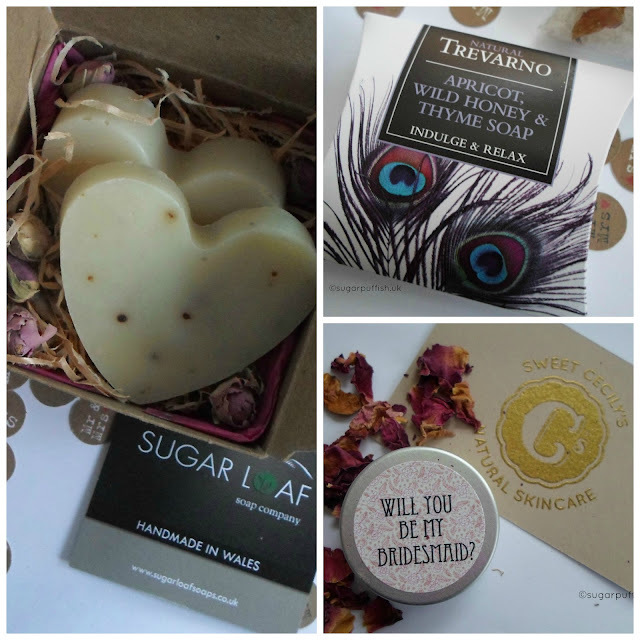 They have a flexible approach to their wedding favours and Sam offers everything from unwrapped heart soaps to bespoke personalised gift boxes. She will work with you to customise every little detail. Soaps can be made in any scent offered on the website. A minimum 6 week window is required for producing your favours, a 50% deposit upon confirming order with remainder paid on dispatch, favours are sent next day courier and fully insured. Sam has kindly offered my readers a 15% off discount code (Sugarpuff15) across everything until the end of 2016. 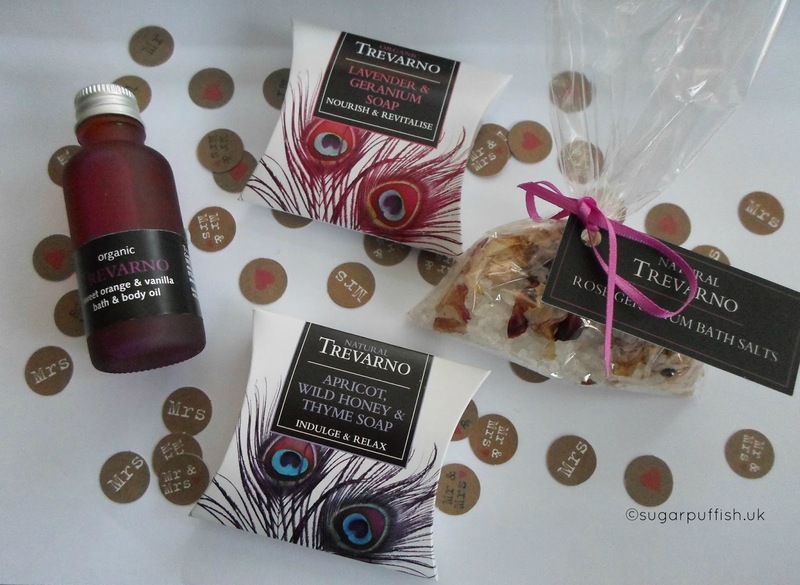 You may have heard of Trevarno Organic Skincare, they are a Cornish Company. They offer a small range of natural and organic wedding favours (soap, bath salts and bath oils). You can purchase direct from their website and everything is pre-packaged as per my picture. Trevarno informed me they are more than happy to help out if you are unable to find your perfect product or colour combination. Everyone needs a lip balm and Sweet Cecily's have a label design tool for you can customise the tin. You can upload your own images or use a suggested template, I like the personalised monogram. Sweet Cecily lip balms are handmade with Fairtrade organic shea butter, along with cocoa butter, almond oil and calendula oil. There are several flavours to choose from Strawberries & Cream, Banoffee, Lime & Mango, Earl Grey, Chocolate, Mojito or Pina Colada. Alternatively, select “Mixture” and they will supply a combination of all the flavours. If you are curious about my wedding favours I’m keeping that a secret because friends and family read my blog! 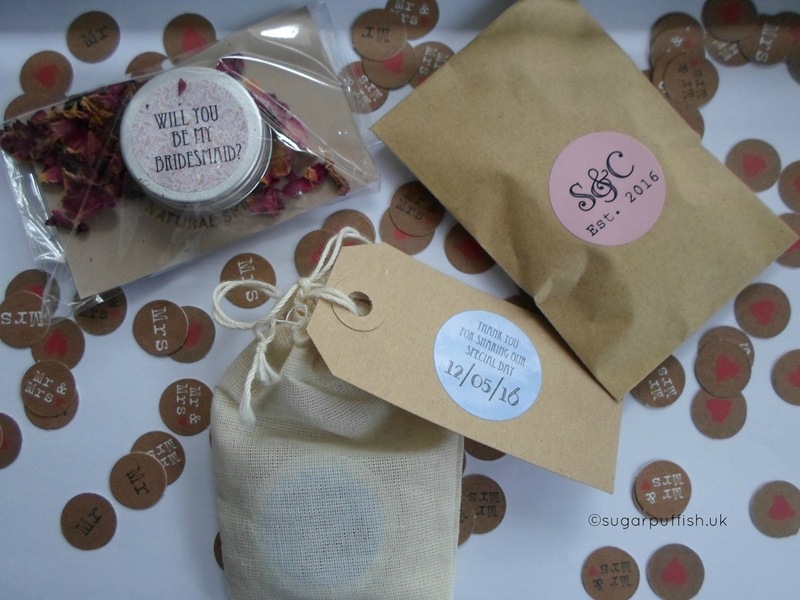 Such a lovely idea for favours. It's always great when you can support small businesses too. I'm sure everyone would enjoy these favours. Packaging looks great too. If I wasn't married already I would so steal this idea.